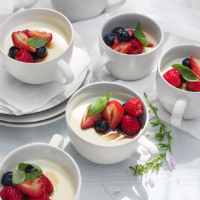 We've infused this traditional dessert with the delicate flavour of basil. A perfect match for juicy summer berries. Roughly chop 40g of the basil, including stalks. Put the milk in a saucepan with the sugar and chopped basil and bring to the boil, then remove from the heat and leave to infuse for 15 minutes. Soak the gelatine leaves in a bowl of cold water for 5 minutes to soften. Return the milk to the boil and strain through a fine sieve into a large jug, pressing the basil pulp with the back of a spoon to squeeze out the juices. Lift the gelatine out of the water and lower into the hot milk. Stir until dissolved. Stir in the cream then pour into 6 china cups or 100ml dariole moulds. Chill for at least 6 hours or until set. Pierce the blueberries with the tip of a knife and mix with the strawberries, raspberries, sugar and balsamic. Spoon on top of the panna cotta and decorate with the remaining basil leaves to serve. Or, if using moulds, briefly immerse them in a bowl of hot water and invert onto serving plates, shaking them well to loosen. Surround with the berries and decorate with the basil.